I had the pleasure of speaking with Ruth Ruderham at the IOF convention last year. At the time she was at Christian Aid (she has since moved to British Waterways) and she spoke about the Nets campaign that they were successfully running. It struck me at the time that the real strength of the campaign was in the ask. 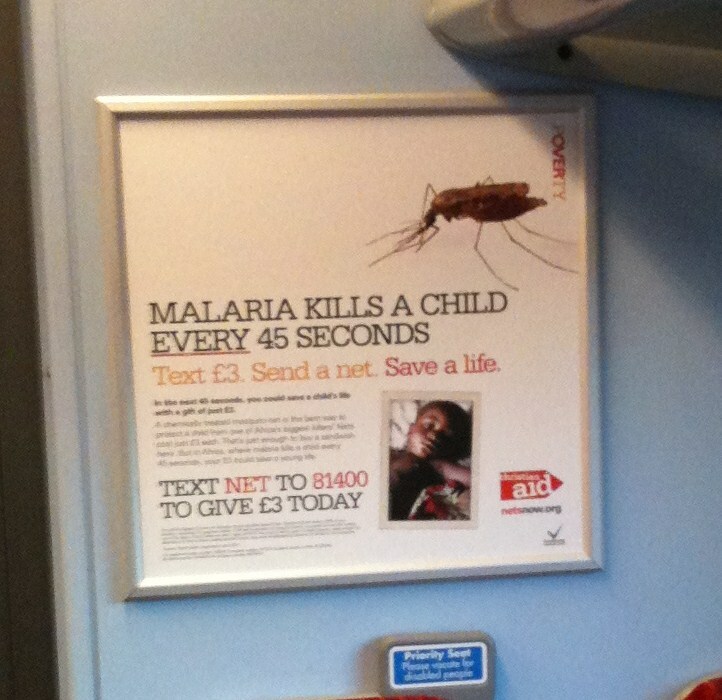 For those of you that haven’t seen it, Christian Aid is focussing in on one area of work, stopping the spread of malaria and therefore saving children’s lives. The answer, as so often is the case, is simple – a mosquito net that costs just £3. What a fantastic ask – I can save a child’s life, I can see exactly where my money is going and I can feel great immediately. With this ask, they have used lots of different channels. If we fast forward 6 months, you will find me sitting on a train looking at a Nets ad on a panel. It stands the test of time. Train posters are a great discipline. To tell the story well, the ask needs to be simple, tangible and immediate. The Christian Aid ad has all of this. There is a really clear need, a real threat, a solution that I can play. And, most importantly, I can see what I am going to achieve. 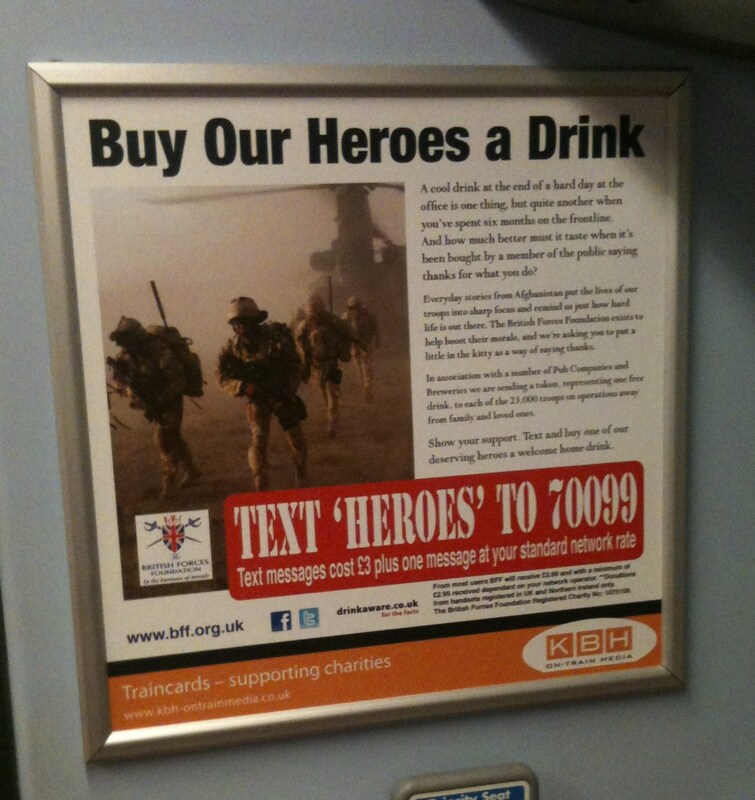 Alongside it is another that I think has a fantastic ask – buy a hero a drink. Again it’s a £3 text ask. Again it’s simple, tangible and immediate. Again, how could I not do it? Again, I can see exactly what my donation is going to achieve and I can see the impact that I will have. I feel great! Unfortunately, not all the ads I’m looking at are the same. (South West Trains has recently turned my 07:38 to Waterloo into a showcase for these ads recently). 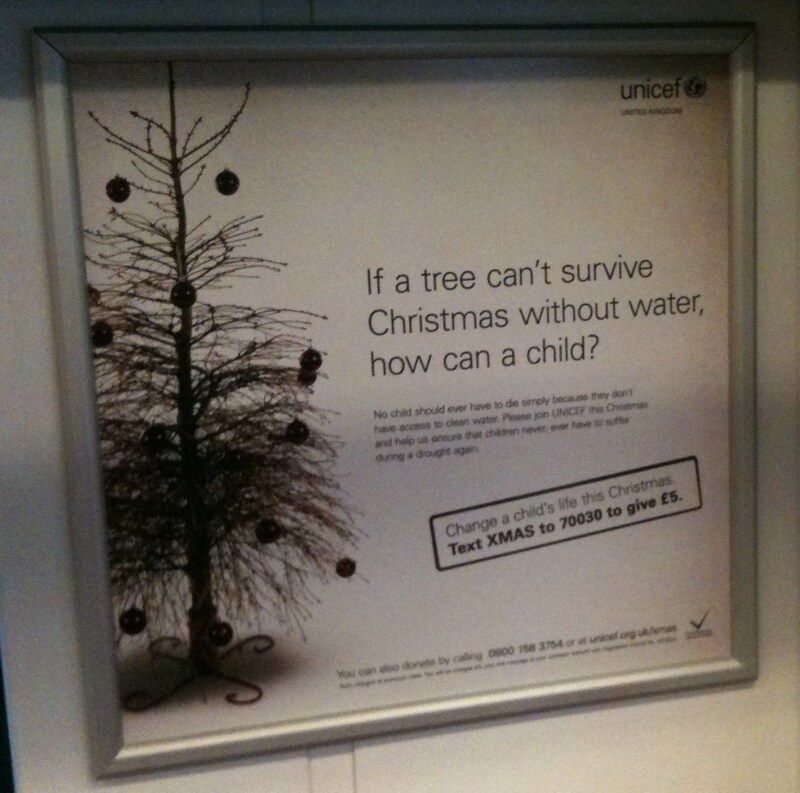 I am looking at ads from UNICEF where the ask isn’t clear. To be honest, it looks like they have started from the perspective of how ‘can we make an ad for Roger’s train?’ rather than start with a great ask. Yes, UNICEF is a fantastic organisation and yes we know they do great work. But I’m left wondering what my money is needed for, what it will achieve and what I will have done if I give. I hope that the goodwill that UNICEF undoubtedly has in bucket-loads means this will be cost-effective, but I fear not. Recently the Agitator asked us to share our dreams. Mine is simple – that all fundraising will be based around a great ask. Sounds simple, doesn’t it? So why do so many of us make it look difficult. Over the next few weeks, I will blog about what I think the best asks in fundraising are. In the mean time, I’d love to hear what you think are the best.